Illness is expensive! Have you noticed? Those doctor bills, medications, rehabs, equipment. . . even when you have insurance it can quickly add up to the thousands of dollars. There are a variety of steps you can put into practice when shopping on the Internet and locally. Oftentimes we get so busy buying the item we need we simply forget one of the steps and we miss out on additional savings. 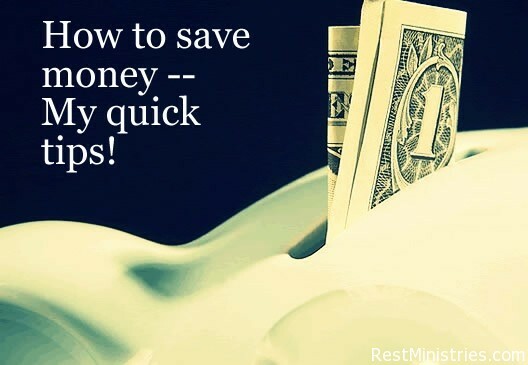 Here are some of the ways I have been saving extra money recently. Feel free to print this out and sit it beside your desktop to refer to before type in that credit card for anything. Ebates. You really do get a check. Like “rebates” that you have received when you have bought items in the past, you sign up at this web site for free and then get a check in the mail later with bonus rebates. Rest Ministries is partnered with ebates so if you use this link http://ow.ly/9NLKw we will also receive $5 per person plus $40 when 4 people sign up (wow!). They list the many companies they work with from Target to Vistaprint, Lane Bryant to Safeway, Walgreens to Tracfone; Overstock.com, Bath and Body Works, and even Groupon. You can see how much of the percentage of your purchase price you will get back from ebates.com. I have been a member since 2000 and I have been able to donate nearly $700 to Rest Ministries from the items I have purchased through ebates, especially with print jobs. Have company coming or just want to find local deals? Many people know about Groupon, Living Social, or Circle Buzz which can be a gold mine for finding local entertainment, movies, restaurants and more at a deal. But what if you missed the deal? There are many web sites that sell these deals after the sale date, by people who purchased it on time, but now are unable to use it. I just found a $40 gift certificate for $23 at GNC for vitamins and such. This would be a great deal if I shopped for vitamins there! I also saw a $110 massage for just $24. Too bad massages hurt with my fibromyalgia or I’d be tempted to buy this deal. I have become quite a coupon clipper in the last year. I tend to use Sunday paper coupons along with ALL YOU Magazine, coupons online, digital coupons, printable coupons, and store ads. I love the thrill when you end up with a Buy One Get One Free deal and you save over 50% off of the one you have bought! My favorite weekly tips, the Weekly Store Deals Round Up comes from Clippin’ with Carrie She has a long list each week of what is on sale where. Where to find the coupons, what items are free, etc. I scan it and see if there is anything I need that I have missed a deal for. Every store has a specific set of rules regarding return policies, discounts, double coupons, etc. among the coupon forums it is said that oftentimes the people who work at the stores don’t always know the policies themselves. It is helpful to keep a copy of the policies of those stores you frequently shop at on your mobile device or printed out in your car. Just because you can find a razor for $2 doesn’t mean it is a deal if you haven’t shaved your legs for 2 years. You likely don’t need a Power Rangers DVD even if it is just $5. But. . . there are some great coupons and savings for things you may likely need. I have stocked up on food, heated patches for pain, vitamins, and other items that I know I will use in the coming months. Most items at the grocery store that are on sale, go on sale every 4-5 weeks. Other specialty items may be about every 90 days. Buy what you need or else it is really not a savings. My Quick Tips <Liked it! I love shopping the goodwill stores! I look for expensive name brands. My grand daughter wears very nice clothes that only cost a fraction of what someone else paid for it. I also look for baskets, flower pots, etc. that I can do some crafts. It’s fun looking for the bargains.